Gray Steel dominates the Prix Amadou (Gr.2). Created by Isabelle & Nicolas Simon, Haras des Marais has been breeding thoroughbreds since 1999. Located 20 miles from Le Mans, 45 minutes from Alençon, one hour and an half from Longchamp or Auteuil, Haras des Marais can boast themselves with the birth of 49 winners since 2004. Labour teamed with ambition! And the hunch to purchase Folklorique, future dam of Gray Steel! 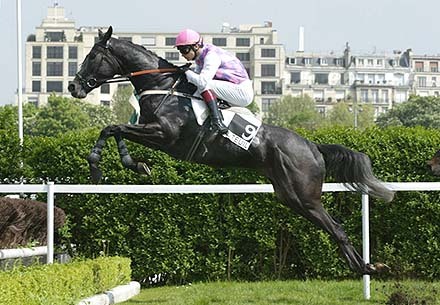 If Mister Nikos, Miss Laos and Négresse de Cuta were the pioneers, Gray Steel's advent at Auteuil will remain as the first big event for Haras des Marais. Flash-back! Spring 2006! Tidal Fury has calmed down. This sudden ebbing of the 2005 3yo champion leads the way to the best 4yo hurdler throne. On the 7th of may, at Auteuil for the Prix Amadou (Gr.2), the racing sport lovers have had the great privilege of watching a horse opening his record directly in a group. His name? Gray Steel. After choosing not to race in the Grande Course de Haies d'Eté des 4 Ans (Lina Drop), Gray Steel confirms, upon his return in september, by obtaining a second group, Prix de Maisons-Laffitte (Gr.3). The most gorgeous grey horse having cantered on the Auteuil grass since Great Love, Gray Steel, overheated metal, has definitely impressed by a royal attitude over jumps. Beautiful memories, the past victories of Gray Steel should not however obscure the evident success of many horses bred by the Haras des Marais. Recently, two performers bred at Haras des Marais have shown off in flat races : Prince Chéri, second of the Grand Prix de Clairefontaine 2012 (L.) before a victorious exportation in Australia and Domeside, impressive winner of the Prix Vicomtesse Vigier 2013 (Gr.2) at Longchamp. Security and well being, renewed investments, the will to go to excellent stallions, an avowed taste - but not exclusive of course - for Germany, Haras des Marais is a place, a place where it is good to be born a racehorse.